Home / Health / Is honey better than sugar? Very often honey is used in the food industry as a way to entice consumers to favor a particular food over another; even in cases where the quantity of honey contained in the food is too small compared to sugar! In the eyes of most consumers honey is the healthiest alternative to granulated sugar. That’s what people think but what does research say, is honey better than sugar? Honey is mainly composed of the monosaccharides glucose and fructose, like sugar. It contains about 17% water which means that the water content is higher than that of sugar. Additionally, it contains small amounts of pollen, wax and various trace minerals. A teaspoon of honey contains 22 calories, while the same quantity of sugar 16. This may sound paradoxical, because honey is made up of 82% sweeteners (the remainder is water), while sugar is 99.98%. The caloric difference is explained by the higher density of honey with respect to that of sugar. 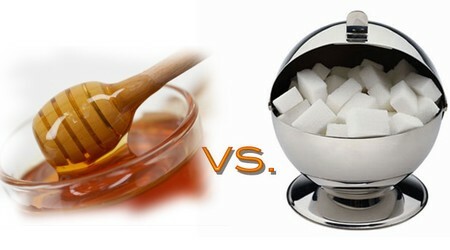 100 grams of sugar contain 380 calories, while the same amount of honey about 300, i.e. 27% less. In sugar, the molecules of fructose and glucose are linked together forming the compound sucrose. Instead, in honey the molecules of fructose and glucose “float” separately and independently. Fructose is sweeter than glucose and sucrose and is present in higher amounts in honey. This explains why honey is slightly sweeter than sugar. Thus, although it contains slightly more calories than sugar, a smaller quantity is needed to feel the same sweet taste. The main characteristic of honey, which separates it entirely from sugar, is its antibacterial and anti-inflammatory properties. The presence of trace elements and vitamins may be considered an advantage, however the quantities are so small that hardly noticeable. For example, an average adult needs to consume 40 cups of honey to cover the daily needs of iron. At this point it should be noted that honey also contains the bacterium “clostridium botulinum”, which makes it absolutely and strictly inappropriate for consumption by children younger than 12 months. Despite the above differences, honey has a number of health benefits when compared to sugar. Good for the heart: The components of honey, particularly glucose is necessary for the contractions of the heart muscle and an energy source for the heart. In addition the sugars found in honey together with acetylcholine help dilate blood vessels and lowers blood pressure. Metabolism: Honey can help people with slow metabolism, hyperinsulinism and water retention in the tissues. Stomach disorders and intestinal diseases: Honey being an alkaline food reduces acidity in the stomach. It is very helpful in cases of ulcers of the stomach and duodenum. It is also considered as one of the best natural light laxatives. Liver: Glucose found in honey complements the glycogen in the liver. The liver is responsible (among other things) to degrade substances that are dangerous for the body such as toxins. The presence of glycogen enhances this work and increases the body’s resistance to infections. It is also excellent for restoring muscle tissue after intense exercise. Cure for hangover: Due to the high percentage of fructose in combination with enzymes found in honey, make it a suitable cure for a hangover especially if combined with lemon juice. In general both honey and sugar should be consumed in limited quantities. While honey holds a narrow lead, excessive consumption may constitute a greater risk to your health from the advantages it has over sugar.